MSNBC has caught on that NumbersUSA is the main roadblock to getting their treasured amnesty for 28 million illegal aliens. Guess who they attacked on their TV network all day long today? Roy Beck and NumbersUSA. Our need is extreme. The situation is desperate. If you want to stop a massive amnesty, send a donation right now. NumbersUSA must counter aliens’ political push: We have the members, we have the message, but will we have the funds? APRIL 11, 2013 UPDATE: Amnesty supporters doubtlessly were dismayed by yesterday’s rally turnout. Three years ago, when we defeated the last amnesty push, they had at least 60,000 at the rally; this time, fewer than ten thousand showed up. Meanwhile, our members made thousands of calls yesterday alone, and, just in the past few weeks, sent more than one and a half million faxes. Big Business, Big Labor, Big Media and Big Government have lined up behind our opponents, but we have your support — the American People..
WE HAVE RECEIVED $2,176 FROM OREGON, SO FAR. BUT OUR GOAL IS $4,050. CAN YOU HELP US RAISE $1,874 MORE? SPECIAL NOTE: The response to our action alerts has been overwhelming. If you had difficulty reaching our web site yesterday, please try again, today. 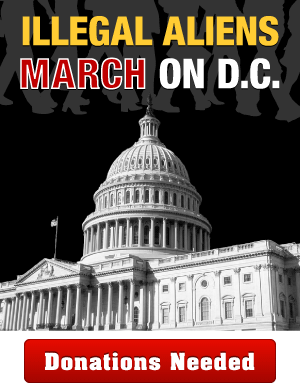 Illegal immigrants and their supporters have been marching on Washington, D.C. today to demand an amnesty. But, our members have been countering by letting Congress know how their voting constituents feel about rewarding lawbreakers by granting them citizenship. Our membership has been pounding Congress, demanding that their lawmakers reject amnesty. In the past month alone, you’ve sent 1.3 million faxes. That may just be part of the reason why leading proponents of amnesty in Washington have been unable to agree on a bill they think they can get past their constituents. In many ways, we’re in very good shape for this fight: Since the last time there was such a grave threat of Congress passing a comprehensive amnesty, our membership has grown by nearly one million members. In fact, we gained 20,000 members just last week. But there is some frightening news, as well. While our members are more determined than ever to defeat an amnesty, many still haven’t bounced back from the Great Recession. They face high unemployment, early retirements, poor investment returns and, for many of small business owners, weak sales. If you do not have the money to give to NumbersUSA, we understand completely. But if you have a reasonably secure income, we urgently appeal to you to help us continue to offer our services free of charge for everyone. During our last fundraiser, we raised $2,176 from Oregon for this current push to counter the illegal aliens’ march on Washington. Frankly, we needed to raise more. On top of that, we also need to meet our regular monthly budget. Our opponents get hundreds of millions from foundations; we have to rely on our faxing and phone calls coordinating office visits, and for those expenses, we need the contributions of our members. We must raise $1,874 from Oregon this week! Every dollar will help the fight against amnesty! 1. We’ve delivered 1.3 million faxes in the past month. Our members have faxed their Members of Congress, and signed our new petitions to Congress, their governors, and the President to Stop Amnesty. We’ve demanded that our elected officials get busy on increasing enforcement. If you haven’t sent a fax, lately, click here… but be sure to finish reading this article! If you’ve sent a fax, keep a watch out for further updates. 2. We’ve sent 10 million e-mails. To prepare our 1.5 million members for such a level of activism, we have written and delivered 10 million e-mails in the past two weeks. These emails include Roy’s Amnesty Updates, sent every couple days during this crisis, so our membership keeps up to date with what urgent actions we need. 3. Today, we start flooding Congress with phone calls. NumbersUSA’s defeat of the big push for amnesty in 2007 became legend on Capital Hill. For days, we overwhelmed Congress’ switchboard. As the debate went on, we convinced enough senators to vote against amnesty that the bill’s motion to proceed couldn’t even get a simple majority, let alone the super-majority that it needed. This time, the bill hasn’t even been introduced, but our members are already making thousands of phone calls. SPECIAL NOTE: The response to our action alerts has been overwhelming. If you have trouble reaching our donation page, please try again, or come back soon! 4. We’re webcasting from the Mall. Update: Check out our fantastic footage from the rally. Frankly,this is the time to break the piggy bank and send us a gift. Today! Right now! We have received $2,176 from Oregon, so far. But our goal is $4,050. Can you help us raise $1,874? Paul , I don’t know your current financial situation, but please consider a a gift of $75 to launch our Stop Amnesty effort and turn back this pro-Amnesty invasion. 1) On-line credit card. We take all major cards. 3) Check — see the instructions and a form to print out and send with your check. 4) Call (877) 885-7733 to arrange a wire transfer, stock donation, or to make a credit card donation over the phone. If our office is closed, please leave the time and your phone number and we will call back. Keep the faith, and don’t ever give up! This entry was posted in Uncategorized and tagged desperate. If you want to stop a massive amnesty, Illegal immigrants march on D.C. as Amnesty bill, MSNBC Media Blame Roy Beck Numbersusa for Stopping Criminal Amnesty for 28 milllion plus illegals, Roy Beck and NumbersUSA., send a donation right now.. Bookmark the permalink. I just donated some money to help support the Patriots who are fighting to defend our country from the 3rd world invaders and the traitors in our own Govt selling us out.. Keep up the good work.. Please look at The DC Caller this morning about Steve King and Lou Barletta standing strong against the invasion.. I called all on the article and voiced my support..